This article is about E.I. du Pont de Nemours and Company. For other uses, see Dupont (disambiguation). E. I. du Pont de Nemours and Company, commonly referred to as DuPont, is an American conglomerate that was founded in July 1802 as a gunpowder mill by French Éleuthère Irénée du Pont. In the 20th century, DuPont developed many polymers such as Vespel, neoprene, nylon, Corian, Teflon, Mylar, Kevlar, Zemdrain, M5 fiber, Nomex, Tyvek, Sorona, Corfam, and Lycra. DuPont developed Freon (chlorofluorocarbons) for the refrigerant industry, and later more environmentally friendly refrigerants. It also developed synthetic pigments and paints including ChromaFlair. DuPont was founded in 1802 by Éleuthère Irénée du Pont, using capital raised in France and gunpowder machinery imported from France. 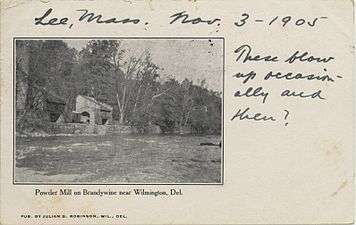 The company was started at the Eleutherian Mills, on the Brandywine Creek, near Wilmington, Delaware, two years after he and his family left France to escape the French Revolution and religious persecutions against Huguenot protestants. It began as a manufacturer of gunpowder, as du Pont noticed that the industry in North America was lagging behind Europe. The company grew quickly, and by the mid-19th century had become the largest supplier of gunpowder to the United States military, supplying half the powder used by the Union Army during the American Civil War. The Eleutherian Mills site is now a museum and a National Historic Landmark. DuPont continued to expand, moving into the production of dynamite and smokeless powder. In 1902, DuPont's president, Eugene du Pont, died, and the surviving partners sold the company to three great-grandsons of the original founder. Charles Lee Reese was appointed as director and the company began centralizing their research departments. 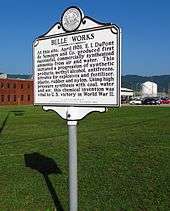 The company subsequently purchased several smaller chemical companies, and in 1912 these actions gave rise to government scrutiny under the Sherman Antitrust Act. The courts declared that the company's dominance of the explosives business constituted a monopoly and ordered divestment. The court ruling resulted in the creation of the Hercules Powder Company (later Hercules Inc. and now part of Ashland Inc.) and the Atlas Powder Company (purchased by Imperial Chemical Industries (ICI) and now part of AkzoNobel). At the time of divestment, DuPont retained the single base nitrocellulose powders, while Hercules held the double base powders combining nitrocellulose and nitroglycerine. DuPont subsequently developed the Improved Military Rifle (IMR) line of smokeless powders. In 1910, DuPont published a brochure entitled "Farming with Dynamite". The pamphlet was instructional, outlining the benefits to using their dynamite products on stumps and various other obstacles that would be easier to remove with dynamite as opposed to other more conventional, inefficient means. DuPont also established two of the first industrial laboratories in the United States, where they began the work on cellulose chemistry, lacquers and other non-explosive products. DuPont Central Research was established at the DuPont Experimental Station, across the Brandywine Creek from the original powder mills. In 1914, Pierre S. du Pont invested in the fledgling automobile industry, buying stock in General Motors (GM). The following year he was invited to sit on GM's board of directors and would eventually be appointed the company's chairman. The DuPont company would assist the struggling automobile company further with a $25 million purchase of GM stock. In 1920, Pierre S. du Pont was elected president of General Motors. Under du Pont's guidance, GM became the number one automobile company in the world. However, in 1957, because of DuPont's influence within GM, further action under the Clayton Antitrust Act forced DuPont to divest its shares of General Motors. In the 1920s, DuPont continued its emphasis on materials science, hiring Wallace Carothers to work on polymers in 1928. Carothers invented neoprene, a synthetic rubber; the first polyester superpolymer; and, in 1935, nylon. The invention of Teflon followed a few years later. DuPont introduced phenothiazine as an insecticide in 1935. DuPont also played a major role in the Manhattan Project in 1943, designing, building and operating the Hanford plutonium producing plant in Hanford, Washington. In 1950 DuPont also agreed to build the Savannah River Plant in South Carolina as part of the effort to create a hydrogen bomb. After the war, DuPont continued its emphasis on new materials, developing Mylar, Dacron, Orlon, and Lycra in the 1950s, and Tyvek, Nomex, Qiana, Corfam, and Corian in the 1960s. DuPont materials were critical to the success of the Apollo Project of the United States space program. DuPont has been the key company behind the development of modern body armor. In the Second World War DuPont's ballistic nylon was used by Britain's Royal Air Force to make flak jackets. With the development of Kevlar in the 1960s, DuPont began tests to see if it could resist a lead bullet. This research would ultimately lead to the bullet resistant vests that are the mainstay of police and military units in the industrialized world. In 1981, DuPont acquired Conoco Inc., a major American oil and gas producing company that gave it a secure source of petroleum feedstocks needed for the manufacturing of many of its fiber and plastics products. The acquisition, which made DuPont one of the top ten U.S.-based petroleum and natural gas producers and refiners, came about after a bidding war with the giant distillery Seagram Company Ltd., which would become DuPont's largest single shareholder with four seats on the board of directors. On April 6, 1995, after being approached by Seagram Chief Executive Officer Edgar Bronfman, Jr., DuPont announced a deal in which the company would buy back all the shares owned by Seagram. In 1999, DuPont sold all of its shares of Conoco, which merged with Phillips Petroleum Company, and acquired the Pioneer Hi-Bred agricultural seed company. DuPont describes itself as a global science company that employs more than 60,000 people worldwide and has a diverse array of product offerings. The company ranks 86th in the Fortune 500 on the strength of nearly $36 billion in revenues, $4.848 billion in profits in 2013. In April 2014, Forbes ranked DuPont 171st on its Global 2000, the listing of the world's top public companies. DuPont businesses are organized into the following five categories, known as marketing "platforms": Electronic and Communication Technologies, Performance Materials, Coatings and Color Technologies, Safety and Protection, and Agriculture and Nutrition. The agriculture division, DuPont Pioneer makes and sells hybrid seed and genetically modified seed, some of which goes on to become genetically modified food. Genes engineered into their products include LibertyLink, which provides resistance to Bayer's Ignite Herbicide/Liberty herbicides; the Herculex I Insect Protection gene which provides protection against various insects; the Herculex RW insect protection trait which provides protection against other insects; the YieldGard Corn Borer gene, which provides resistance to another set of insects; and the Roundup Ready Corn 2 trait that provides crop resistance against glyphosate herbicides. In 2010, DuPont Pioneer received approval to start marketing Plenish soybeans, which contains "the highest oleic acid content of any commercial soybean product, at more than 75 percent. Plenish provides a product with no trans fat, 20 percent less saturated fat than regular soybean oil, and more stabile oil with greater flexibility in food and industrial applications." Plenish is genetically engineered to "block the formation of enzymes that continue the cascade downstream from oleic acid (that produces saturated fats), resulting in an accumulation of the desirable monounsaturated acid." In 2004, the company sold its textiles business, which included some of its best-known brands such as Lycra (Spandex), Dacron polyester, Orlon acrylic, Antron nylon and Thermolite, to Koch Industries. In 2011, DuPont was the largest producer of titanium dioxide in the world, primarily provided as a white pigment used in the paper industry. DuPont has 150 research and development facilities located in China, Brazil, India, Germany, and Switzerland with an average investment of $2 billion annually in a diverse range of technologies for many markets including agriculture, genetic traits, biofuels, automotive, construction, electronics, chemicals, and industrial materials. DuPont employs more than 10,000 scientists and engineers around the world. In February 2013, DuPont Performance Coatings was sold to the Carlyle Group and rebranded as Axalta Coating Systems. In October 2013, DuPont announced that it was planning to spin off its Performance Chemicals business into a new publicly traded company in mid-2015. The company filed its initial Form 10 with the SEC in December 2014 and announced that the new company would be called The Chemours Company. The spin-off to DuPont shareholders was completed on July 1, 2015 and Chemours stock began trading on the New York Stock Exchange on the same date. DuPont will focus on production of GMO seeds, materials for solar panels, and alternatives to fossil fuels. Chemours becomes responsible for the cleanup of 171 former DuPont sites, which DuPont says will cost between $295 million and $945 million. On December 11, 2015, DuPont announced that it would merge with the Dow Chemical Company, in an all-stock deal. The combined company, which will be known as DowDuPont, will have an estimated value of $130 billion, be equally held by the shareholders of both companies, and maintain their headquarters in Delaware and Michigan respectively. Within two years of the merger's closure, expected in the first quarter of 2017 and subject to regulatory approval, DowDuPont will be split into three separate public companies, focusing on the agricultural chemicals, materials science, and specialty product industries. Commentators have questioned the economic viability of this plan because, of the three companies, only the specialty products industry has prospects for high growth. The outlook on the profitability of the other two proposed companies has been questioned due to reduced crop prices and lower margins on plastics such as polyethylene. They have also noted that the deal is likely to face antitrust scrutiny in several countries. The company's corporate headquarters are located in Wilmington, Delaware. The company’s manufacturing, processing, marketing, and research and development facilities, as well as regional purchasing offices and distribution centers are located throughout the world. Major manufacturing sites include the Spruance plant near Richmond, Virginia, (currently the company's largest plant), the Washington Works site in Washington, West Virginia, the Mobile Manufacturing Center (MMC) in Axis, Alabama, the Bayport plant near Houston, Texas, the Mechelen site in Belgium, and the Changshu site in China. Other locations include the Yerkes Plant on the Niagara River at Tonawanda, New York, the Sabine River Works Plant in Orange, Texas, and the Parlin Site in Sayreville, New Jersey. The facilities in Vadodara, Gujarat and Hyderabad, Telangana in India constitute the DuPont Services Center and DuPont Knowledge Center respectively. On October 5, 2015, DuPont announced that Ellen Kullman would retire as Chair and CEO on October 16, 2015. Breen was appointed CEO in November 2015 replacing Kullman. In the 1990s, DuPont was a founding member of the World Business Council for Sustainable Development with then DuPont CEO Chad Holliday as chairman of the WBCSD from 2000 to 2001. The organization has developed guidelines for measuring sustainability cited by the Natural Resources Defense Council and the Environmental Defense Fund, and its Vision 2050 blueprint for slowing and reversing environmental damage has been highlighted by The Guardian. In May 2007 the $2.1 million DuPont Nature Center at Mispillion Harbor Reserve, a wildlife observatory and interpretive center on the Delaware Bay near Milford, Delaware was opened to enhance the beauty and integrity of the Delaware Estuary. The facility will be state-owned and operated by the Delaware Department of Natural Resources and Environmental Control (DNREC). In 2010, researchers at the Political Economy Research Institute of the University of Massachusetts Amherst ranked DuPont as the fourth largest corporate source of air pollution in the United States. DuPont released a statement that 2012 total releases and transfers were 13% lower than 2011 levels, and 70% lower than 1987 levels. Data from the EPA’s Toxic Release Inventory database included in the Political Economy Research Institute studies likewise show a reduction in DuPont’s emissions from 12.4 million lbs of air releases and 22.4 million lbs of toxic incinerator transfers in 2006 to 10.94 million lbs and 22.0 million pounds respectively in 2010. Over the same period, the Political Economy Research Institutes Toxic score for DuPont increased from 122,426 to 7,086,303. One of DuPont's facilities was listed No. 4 on the Mother Jones Top 20 polluters of 2010, legally discharging over 5,000,000 pounds (2,300,000 kg) of toxic chemicals into New Jersey/Delaware waterways. In 2012 DuPont was named to the Carbon Disclosure Project Global 500 Leadership Index. Inclusion is based on company performance on sustainability metrics, emissions reduction goals, and environmental performance transparency. In 2014 DuPont was the top scoring company in the chemical sector according to CDP, with a score of "A" or "B" in every evaluation area except for supply chain management. Between 2007 and 2014 there were 34 accidents resulting in toxic releases at DuPont plants across the U.S., with no fewer than 8 fatalities. Four employees died of suffocation in a Houston, Texas accident involving leakage of nearly 24,000 pounds (11,000 kg) of methyl mercaptan. As a result, the company became the largest of the 450 businesses placed into the Occupational Safety and Health Administration's "severe violator program" in July 2015. The program was established for companies OSHA says have repeatedly failed to address safety infractions. DuPont was part of Global Climate Coalition, a group that lobbied against taking action on climate change. DuPont has been awarded the National Medal of Technology four times: first in 1990, for its invention of "high-performance man-made polymers such as nylon, neoprene rubber, "Teflon" fluorocarbon resin, and a wide spectrum of new fibers, films, and engineering plastics"; the second in 2002 "for policy and technology leadership in the phaseout and replacement of chlorofluorocarbons". DuPont scientist George Levitt was honored with the medal in 1993 for the development of sulfonylurea herbicides. In 1996, DuPont scientist Stephanie Kwolek was recognized for the discovery and development of Kevlar. On the company's 200th anniversary in 2002, it was presented with the Honor Award by the National Building Museum in recognition of DuPont's "products that directly influence the construction and design process in the building industry." Pioneer Hi-Bred, a DuPont subsidiary, manufactures genetically modified seeds, other tools, and agricultural technologies used to increase crop yield. DuPont, along with Thomas Midgley working under Charles Kettering of General Motors, was the inventor of CFCs (chlorofluorocarbons). CFCs are ozone-depleting chemicals that were used primarily in aerosol sprays and refrigerants. DuPont was the largest CFC producer in the world with a 25 percent market share in the 1980s, totaling $600 million in annual sales. In February 1988, U.S. Senator Max Baucus, along with two other Senators, wrote to DuPont reminding the company of its pledge. The Los Angeles Times reported that the letter was "generally regarded as an embarrassment for DuPont, which prides itself on its reputation as an environmentally conscious company." The company responded with a strongly worded letter that the available evidence did not support a need to dramatically reduce CFC production and calling the proposal "unwarranted and counterproductive". On March 14 of the same year, scientists from the National Aeronautics and Space Agency announced the results of a study demonstrating a 2.3% decline in mid-latitude ozone levels between 1969 and 1986, along with evidence tying the decline to CFCs in the upper atmosphere. On March 24, DuPont reversed its position, calling the NASA results "important new information" and announcing that it would phase out CFC production. The company further called for worldwide controls on CFC production and for additional countries to ratify the Montreal Protocol. DuPont's change of policy was widely praised by environmentalists. In 2003, DuPont was awarded the National Medal of Technology, recognizing the company as the leader in developing CFC replacements. DuPont has faced fines from the U.S. Environmental Protection Agency and litigation over releases of the Teflon-processing aid perfluoro-octanoic acid (PFOA, also known as C8) from their works in Washington, West Virginia. PFOA-contaminated drinking water led to increased levels of the compound in the bodies of residents who lived in the surrounding area. A court-appointed C8 Science Panel investigated "whether or not there is a probable link between C8 exposure and disease in the community." They eventually concluded that there is a probable link between PFOA and kidney cancer, testicular cancer, thyroid disease, high cholesterol, pre-eclampsia and ulcerative colitis. Perfluorooctanoic acid lasts around 90 years in the environment, remaining toxic, and appears to have a half-life of about 4 years in the human body. In 2014, the International Agency for Research on Cancer designated PFOA as "possibly carcinogenic" in humans. One Ohio resident was awarded $1.6 million when a jury in 2015 found that her kidney cancer was caused by PFOA in drinking water. There are 3,400 similar cases awaiting trial. According to the co-lead counselor, internal documents revealed during trial showed DuPont knew of a link between PFOA and cancers since 1997. DuPont maintains it has always handled PFOA "reasonably and responsibly" based on the information they, and industry regulators, had available during its use. However, the jury concluded that DuPont did not act to prevent harm or inform the public, despite the information available. In October 2010 DuPont began marketing a herbicide called Imprelis, for control of certain plants in turf areas. It had the unintended effect of killing certain evergreen tree species and was recalled. In 2005, the company plead guilty to fixing prices of chemicals and products using neoprene, a synthetic rubber, resulting in a $84 million fine. The partnership lasted 18 seasons before DuPont was replaced by AARP Drive to End Hunger as the No. 24 team's primary sponsor. DuPont continued as associate sponsor with a 12-race deal, and the deal was extended to 14 races after DuPont sold its performance coatings business, now known as "Axalta Coating Systems", to The Carlyle Group in a deal worth $4.9 billion. In addition to Gordon, DuPont sponsored Scott Lagasse in the SuperTruck Series presented by Craftsman during the 1995 season (including a one-off ride for Terry Labonte in the Skoal Bandit Copper World Classic, the inaugural Truck race). In the Busch Series, the company sponsored Ricky Craven's RC Racing team in the early 1990s. 1 2 3 "2013 DuPont Databook" (PDF). DuPont. Retrieved January 16, 2015. 1 2 3 4 5 6 "E I Du Pont De Nemours And Co 2015 Annual Report Form (10-K)" (XBRL). United States Securities and Exchange Commission. February 5, 2016. ↑ "2014 Global 500 companies ranked by sector" ( Excel Spreadsheet). The Financial Times. June 27, 2014. Retrieved January 16, 2015. ↑ "The ICIS Top 100 Chemical Companies" (PDF). ICIS Chemical Business Magazine. Reed Business Information: 36. September 8–14, 2014. Retrieved January 16, 2015. ↑ Class of 811 Graduated: Sketches of Honored Alumni. Philadelphia, PA: The Pennsylvania Gazette. June 27, 1919. p. 875. Retrieved 3 January 2015. ↑ "The DuPont Company". Delaware Historical Society. Retrieved March 29, 2006. ↑ "Farming with Dynamite". Retrieved December 12, 2015. ↑ "Achievements of Professional Entomology : Extension : Clemson University : South Carolina". ↑ "Seagram Co., Dupont Agree On Stock Sale The Chemical Firm Will Pay $8.8 Billion For 156 Million Shares That Seagram Has. The Beverage Firm Is Likely To Use The Money To Buy Mca Inc. – philly-archives". ↑ Starkey, Jonathan (June 12, 2011). "DuPont pays no tax on $3B profit, and it's legal". The News Journal. New Castle, Delaware. Archived from the original on June 13, 2011. Retrieved June 13, 2011. ↑ "Fortune 500: E.I. du Pont de Nemours and Company". Fortune. Retrieved January 16, 2015. ↑ "Global 2000: E.I. du Pont de Nemours and Company". Forbes. Retrieved January 16, 2015. ↑ Archived July 20, 2013, at the Wayback Machine. ↑ "US Approves DuPont Plenish Soybeans – Farm Chemicals International Website – Farm Chemicals International – Article". Farm Chemicals International. 2010-06-08. Retrieved 2012-09-30. ↑ "Replacing Trans Fat | March 12, 2012 Issue – Vol. 90 Issue 11 | Chemical & Engineering News". Cen.acs.org. Retrieved 2012-09-30. ↑ Jonathan Starkey (April 21, 2011). "DuPont quarterly profit up 27%". News Journal. Wilmington, Delaware: Gannett. Business. Retrieved April 22, 2011. DuPont, the world's largest producer of titanium dioxide, produces the pigment at the Edge Moor manufacturing facility, primarily for the paper industry. ↑ "DuPont to Acquire Danisco for $6.3 billion – WILMINGTON, Del., Jan. 9, 2011 /PRNewswire/ –". prnewswire.com. Retrieved January 9, 2011. ↑ "DuPont Successfully Completes Tender Offer for Danisco – Yahoo! Finance". finance.yahoo.com. Retrieved May 16, 2011. ↑ DuPont Acquires Full Ownership of Solae Archived May 9, 2012, at the Wayback Machine.. Solae.com (2012-05-01). Retrieved on 2013-09-05. 1 2 Bromberg, Nick (February 4, 2013). "Jeff Gordon's DuPont No. 24 will be changing in 2013". Yahoo! Sports. Retrieved February 5, 2013. ↑ Casey, Simon (24 October 2014). "DuPont to Spin Off Performance Chemicals Unit to Shareholders – Bloomberg". bloomberg.com. Retrieved December 22, 2014. ↑ Stynes, Tess (18 December 2014). "DuPont Names Planned Performance Chemicals Spinoff – WSJ". wsj.com. Retrieved December 22, 2014. ↑ "DuPont Completes Spin-off of The Chemours Company – WILMINGTON, Del., July 1, 2015 /PRNewswire/ –". prnewswire.com. July 1, 2015. Retrieved July 1, 2015. ↑ Kary, Tiffany. "DuPont Transfers Pollution Liabilities for 171 Sites to New Company Chemours". Insurance Journal. Bloomberg. Retrieved 10 November 2015. ↑ "Dow and DuPont, two of America's oldest giants, to merge in jaw-dropping megadeal". Washington Post. December 11, 2015. Retrieved 11 December 2015. 1 2 3 "Bad romance". The Economist. ISSN 0013-0613. Retrieved 2016-02-10. ↑ Lydia Mulvany, Sara Forden, and Patrick Gower, "Dow-DuPont Merger Likely to Face Antitrust Scrutiny Worldwide", Bloomberg Business (December 11, 2015). ↑ "2009 SEC 10-K". Retrieved February 12, 2008. ↑ "Spruance Site: About Our Plant". Dupont. Retrieved Jan 16, 2010. "2008 Dupont: CEFIC European Responsible Care Award 2008: Application Form". European Chemical Industry Council. Retrieved Jan 16, 2010. "United States Securities and Exchange Commission: Form 10-K" (PDF). Analist.nl Nederland/Hoofdkantoor. 2008. pp. 10–11. Retrieved Jan 16, 2010. ↑ "Edward D. Breen is interim chairman and CEO; DuPont USA". dupont.com. Retrieved October 23, 2015. 1 2 "DuPont Names James C. Collins and Matthew L. Trerotola as Executive Vice Presidents" (Press release). October 24, 2014. Retrieved January 16, 2015. ↑ "Board of Directors - DuPont USA". Retrieved December 12, 2015. ↑ de la Merced, Michael J. (5 October 2015). "DuPont Chief Executive Ellen Kullman to Retire". Dealbook. New York Times. Retrieved 5 October 2015. ↑ Gara, Antoine. "DuPont's New CEO Ed Breen Led The Decade-Long Breakup Of Tyco International". Forbes. Retrieved 9 November 2015. 1 2 Mordock, Jeff (November 9, 2015). "Cuts start under new DuPont CEO". delawareonline.com. Retrieved November 12, 2015. ↑ "ICCF Leadership in Business Award". ↑ "Biofuel Sustainability Performance Guidelines" (PDF). Retrieved 2015-11-12. ↑ "World Business Council for Sustainable Development: Vision 2050 | Guardian Sustainable Business | The Guardian". ↑ Unknown Author (December 6, 2005). "DuPont Tops BusinessWeek Ranking of Green Companies". GreenBiz News. ↑ "State's DuPont Nature Center at Mispillion Harbor Reserve Opens". Archived from the original on 2007-09-29. ↑ "DuPont Nature Center Dedicated in Delaware"
↑ "DuPont Position Statement: Toxic Release Inventory | DuPont USA". ↑ "PERI: Toxic 100 Index (2010)". ↑ "PERI: Toxic 100 Air Polluters 2013". ↑ "America's Top 10 Most-Polluted Waterways". Mother Jones. Retrieved December 12, 2015. ↑ "DuPont recognized for environmental leadership – Commercial Architecture Magazine". ↑ "DuPont Leads Chemical Firms Preparing for a Low-Carbon Economy · Environmental Leader · Environmental Management News". ↑ Olsen, Lise. "DuPont's safety record has slipped in recent years". Houston Chronicle. Retrieved 10 November 2015. ↑ "Report finds series of errors caused deadly DuPont plant accident in La Porte | News – Home". ↑ "2015 – 07/09/2015 – Deaths of four workers prompts deeper look at DuPont Safety Practices". ↑ "A Salute to DuPont" (Press release). National Building Museum. April 11, 2002. 1 2 "Du Pont Will Stop Making Ozone Killers". LA Times. WashingtonPost. ↑ DuPont Refrigerants–History Timeline, 1970. (URL accessed March 29, 2006). ↑ "Behind Du Pont's Shift On Loss of Ozone Layer - NYTimes.com". ↑ "March 25, 1988 – Du Pont acts to cut ozone decay | Chicago Tribune Archive". ↑ "Scientists, technologists win honors – Technology & science – Science | NBC News". ↑ Clapp, Richard; Hoppin, Polly; Jagai, Jyotsna; Donahue, Sara: "Case Studies in Science Policy: Perfluorooctanoic Acid" Project on Scientific Knowledge and Public Policy (SKAPP). Accessed October 25, 2008. ↑ C8 Science Panel: "The Science Panel" Accessed October 25, 2008. ↑ Rich, Nathaniel (January 6, 2016). "The Lawyer Who Became DuPont's Worst Nightmare". New York Times. ↑ Renner, Rebecca: "Scientists hail PFOA reduction plan" Environmental Science & Technology Online. Policy News. (March 25, 2005). Accessed October 25, 2008. ↑ USEPA: "2010/15 PFOA Stewardship Program" Accessed October 25, 2008. ↑ Olsen, Geary; Burris, Jean; Ehresman, David; Froehlich, John; Seacat, Andrew; Butenhoff, John; Zobel, Larry (2007). "Half-Life of Serum Elimination of Perfluorooctanesulfonate,Perfluorohexanesulfonate, and Perfluorooctanoate in Retired Fluorochemical Production Workers". Environ Health Perspect. 115 (9): 1298. doi:10.1289/ehp.10009. PMC 1964923 . ↑ Benbrahim-Tallaa L, Lauby-Secretan B, Loomis D, Guyton KZ, Grosse Y, El Ghissassi F, Bouvard V, Guha N, Mattock H, Straif K (2014). "Carcinogenicity of perfluorooctanoic acid, tetrafluoroethylene, dichloromethane, 1,2-dichloropropane, and 1,3-propane sultone". Lancet Oncol. 15 (9): 924–5. doi:10.1016/s1470-2045(14)70316-x. PMID 25225686. ↑ Trager, Rebecca. "DuPont found liable for cancer case". Chemistry World. Retrieved 10 November 2015. ↑ "DuPont, Dow unit fined for price fixing". Baltimore Sun. Bloomberg. Retrieved 10 November 2015. ↑ "Sponsors". Jeffgordon.com. Retrieved September 19, 2011. ↑ Newton, David (October 28, 2010). "Jeff Gordon has 3-year sponsorship deal". ESPN. Retrieved December 25, 2012. ↑ Pappone, Jeff (April 22, 2013). "Motorsport teams and sponsors enjoy a mutually beneficial relationship". The Globe and Mail. Toronto. Retrieved December 4, 2013. ↑ "1995 Skoal Bandit Copper World Classic". Racing-Reference. Retrieved October 26, 2015. ↑ "Ricky Craven: NASCAR Xfinity Series Results (races)". Racing-Reference. Retrieved November 6, 2015. Arora, Ashish; Ralph Landau and Nathan Rosenberg, (eds). (2000). Chemicals and Long-Term Economic Growth: Insights from the Chemical Industry. Cerveaux, Augustin. (2013) “Taming the Microworld: DuPont and the Interwar Rise of Fundamental Industrial Research,” Technology and Culture, 54 (April 2013), 262–88. Chandler, Alfred D. (1971). Pierre S. Du Pont and the making of the modern corporation. du Pont, B.G. (1920). E.I. du Pont de Nemours and Company: A History 1802–1902. Boston and New York: Houghton Mifflin Company. Hounshell, David A. and Smith, John Kenly, JR (1988). Science and Corporate Strategy: Du Pont R and D, 1902–1980. Cambridge and New York: Cambridge University Press. ISBN 0-521-32767-9.